HURRY!!! 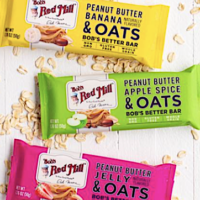 Use code FacebookVIP score a FREE Bob’s Red Mill 3-Bar Sampler Pack! Your sample pack will include three flavors including Peanut Butter Jelly & Oats, Peanut Butter Chocolate & Oats, and Peanut Butter Coconut & Oats. This is their newest product and they want you to give it a try. Note that you may uncheck the email box. While supplies last.